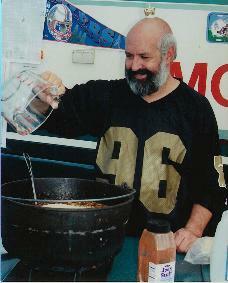 Since 1996 Joe Cahn, the Commissioner of Tailgating, has embarked on a tailgating tour across America. Stopping in at college stadiums on Saturday, NFL stadiums on Sunday then to the Monday Night Football stadium, the Tailgating America tour is the ultimate tailgating experience. In the spring and summer, the tour leaves the gridiron for the asphalts of NASCAR. Stopping in an tailgating at weekly NASCAR races. The Tailgating America tour can also be found in the parking lot of Jimmy Buffet concerts, Mardi Gras and anywhere else there's a party across America. To see where The Commish is heading next please visit our schedule page.